The editors of ‘Mine! A Celebration of Freedom and Liberty for All Benefitting Planned Parenthood’ discuss the Kickstarter for the project. Joe Corallo and Molly Jackson are writers at ComicMix and other places around the internet, but they’re also editors of Mine! A Celebration of Freedom and Liberty for All Benefitting Planned Parenthood. The anthology, which is currently being kickstarted, is a celebration of a fundraiser for Planned Parenthood Federation of America, a nonprofit organization that is one of the biggest and most important health care providers in the United States. The project features work by Neil Gaiman, Jill Thompson, Trina Robbins, John Ostrander, Rachel Pollack, Howard Cruse and others. The campaign runs through Sept. 15, and we reached out to the duo to discuss the project. At one point in our conversation, Dante Luiz referred to himself and H. Pueyo as “two unknown Latin Americans,” and while there may be some truth to that at the moment, it cannot be said that they aren’t incredibly talented. The two writer/artists work separately and together, but they share an interest in South American history and culture, folklore and in looking at violence. Luiz has been published in La Raza Anthology: Unidos y Fuertes and Dates!, and H. has been publishing short fiction in a variety of outlets and has a piece in new volume of the long-running Dirty Diamonds anthology. The two have a short comic in the upcoming anthology Gothic Tales of Haunted Love, which is currently being kickstarted. That’s in addition to their work appearing in other anthologies like Tales from The Public Domain, Tabula Idem, Wayward Sisters and Built on Strange Ground. All this week we’re celebrating the life and influence of comics legend Jack Kirby, who would have turned 100 on Aug. 28. Watch for more interviews and posts as the week continues. Mike Allred is the perfect person to talk to about Jack Kirby for a number of reasons. Right now he’s drawing two books, the ongoing Silver Surfer series at Marvel and the miniseries Bug! The Adventures of Forager at DC. Both characters are Kirby creations, as was Allred’s previous project, Marvel’s FF. Allred remains perhaps best known for his own creations, though, which range from Madman to Red Rocket 7 to The Atomics to iZombie. More than simply being an immensely talented creator, Allred is one of those creators who has long acknowledged his debt to Kirby and his style, and he talked a little about what that has meant to him. Delisle talks about the 15-year long process of making the book and its storytelling challenges. Guy Delisle has a reputation for crafting a series of travelogue books that detail his travels and the long periods of time he’s spent in places like Myanmar (Burma Chronicles) and Israel (Jerusalem: Chronicles from the Holy City), the latter of which received the Prize for Best Album at the 2012 Angouleme International Comics Festival. He’s also the cartoonist behind the series A User’s Guide to Neglectful Parenting. Delisle’s book Hostage is a different book for him. It tells the true story of Christophe Andre, an administrator with Médecins Sans Frontiéres (Doctors Without Borders) who was kidnapped in Chechnya in 1997 and held hostage for 111 days. Delisle takes this story and makes the situation of a single man in a room both dramatic and visually engaging, working in a different style and color palate that readers of his earlier books might have expected. Delisle spoke about the 15-year long process of making the book and its storytelling challenges. The creator discusses the end of ‘Clyde Fans,’ the film ‘Seth’s Dominion’ and more. 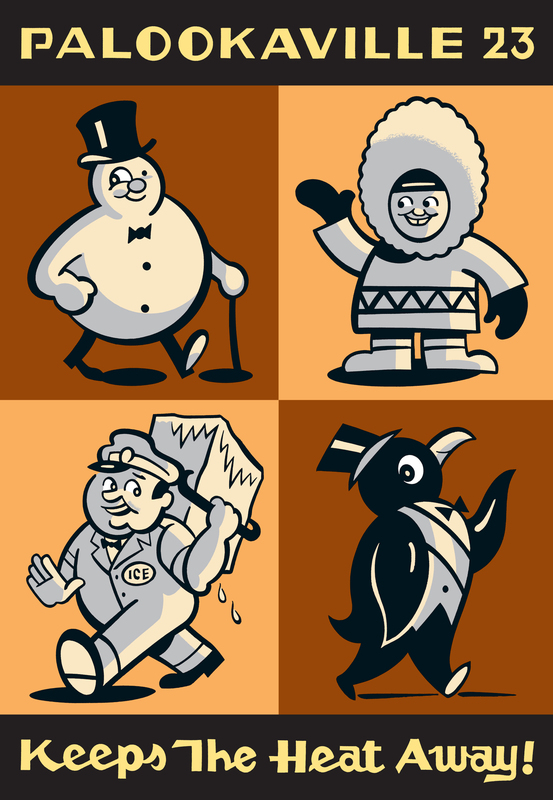 In 2010 the cartoonist Seth revived his old comics series Palookaville as a series of hardcover volumes that come out once every year and a half or two years, in the smaller size and shape that Seth used in books like Wimbledon Green and The Great Northern Brotherhood of Canadian Cartoonists. Palookaville #23 has just been released by Drawn and Quarterly and like the earliest volumes, it contains a few different elements. There is a large selection of paintings that Seth created for two different exhibitions in 2014 and 2015. There’s the third chapter of Nothing Lasts, a memoir that Seth began in earlier volumes, and perhaps most notably, the fifth and final chapter of Clyde Fans. Clyde Fans began many years ago in 1997 in the original Palookaville series, a followup to Seth’s now-classic graphic novel It’s A Good Life, If You Don’t Weaken. The story went on hiatus along with the series, and finishing the series has been one of Seth’s primary projects in the revived Palookaville series. In the interim he has been keeping busy, with a series of graphic novels, New Yorker covers, design projects like The Complete Peanuts, illustrating the Lemony Snicket series All the Wrong Questions, and making paintings and models for various exhibitions. We talked about what finishing the story means to him, what he’s working on next and some thoughts on the film Seth’s Dominion. 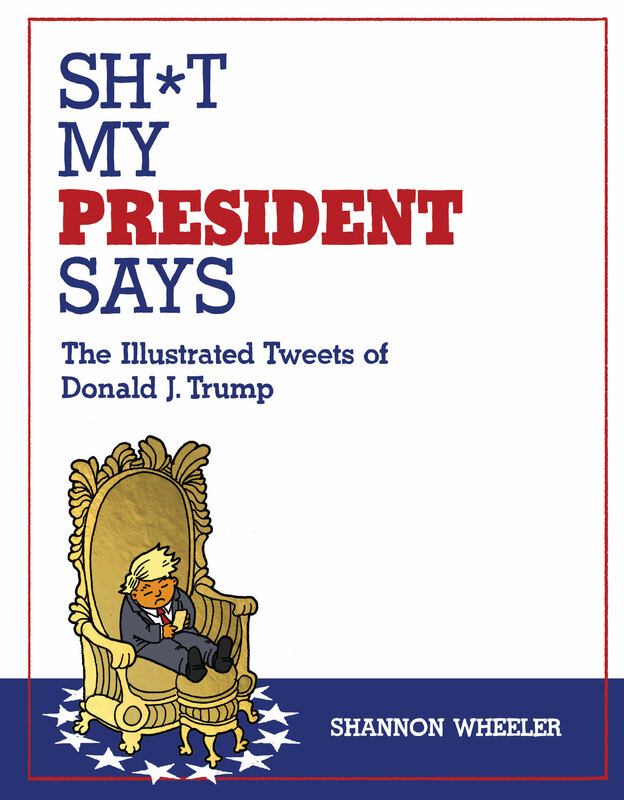 Wheeler discusses his collection of illustrations of U.S. President Donald Trump’s tweets. Shannon Wheeler has been drawing cartoons that are sardonic, sarcastic, political, angry but also strange and funny with its own unique viewpoint for a long time. Like many people I first got to know his work with Too Much Coffee Man. In the years since then Wheeler has drawn books like God is Disappointed in You, written by Mark Russell, and Oil and Water, written by Steve Duin. He’s also continued to work as a cartoonist contributing to The New Yorker and other publications. In recent months though he’s been working on a strange project, illustrating Donald Trump’s tweets. The result is a book just out from Top Shelf, Sh*t My President Says. Since the book went to press, though, Wheeler hasn’t stopped. He’s already made a zine supplement and continues to post the comics on – where else – his Twitter feed. We spoke about how he approaches Donald Trump and why the project wasn’t just parody.